Back in 2012, when all the Euro-finance ministers were making the same kinds of veiled references to “Plan Bs” and so on, I wrote a post about the costs of Greece leaving the Eurozone. And also, what it would take for Greece to leave the Eurozone. If it’s even possible – which it isn’t, technically. Although it might be in practice. So here is an updated version of “Leaving the Euro: Such A Cost“. To begin, given all the austerity that Greece has undergone over the last few years – I guess the real question that we should be asking is: why has Greece not left already? And the answer, really, is that it’s cheaper for them to stay. As Angela Merkel said then, the cost of Greece leaving the Euro would be “incalculable”. Which is literally true – there are too many variables at play. But when there are that many variables at play, analysts just come up with an estimate range, rather than an estimated number. And analysts at UBS have come up with one. So I’m going to summarise the economic costs that are likely to arise should Greece leave the Euro (horribly plagiarised from the UBS report – although I suppose that it’s not really plagiarism once I acknowledge that fact). If you’re interested in reading the full UBS report, the link is here. I also want to point out that there is no legal option for Greece to leave the European Monetary Union (EMU) of its own accord. There is no clause for it in any of the treaties – precisely to discourage any one country from leaving the EMU. There is also no clause in the treaties that would permit the expulsion of Greece from the EMU. To create a legal option for expulsion, there would need to be an amendment to the Maastricht Treaty. In order for the treaty to be amended, there would have to be unanimous consent from all 27 countries, including the country being expelled. And even were Greece to agree to its own expulsion, many of the countries are required to take the amendment back to their people for referenda to take place. So even expulsion is extremely unlikely within the necessary time-frame. Which means that the only option available for Greece is secession – a secession that could presumably be forced upon them by withholding EU bailout funds and ECB lines of liquidity? I mean – I think there are limits to what kind of national indignity the Greeks are willing to withstand. And being cut off and pauperised is a de facto invitation to secede if ever I saw one. The Greek government starts paying its civil servants and pension obligations in IOU notes (meant to be replaced with Euros as and when the Greek government receives those Euros – either through borrowings or through tax collection). These IOU notes are generally known as “scrip”. Then once the scrip are in circulation, overnight, the government could declare the scrip as legal tender, convert all bank accounts to the new “scrip” currency, perhaps rename the scrip “the drachma”, and instantly withdraw the Euro. The Greek government could do what Cyprus did – instantly impose mass surprise restrictions on the banking system, convert all bank accounts to the new currency, and let the thing unfold*. 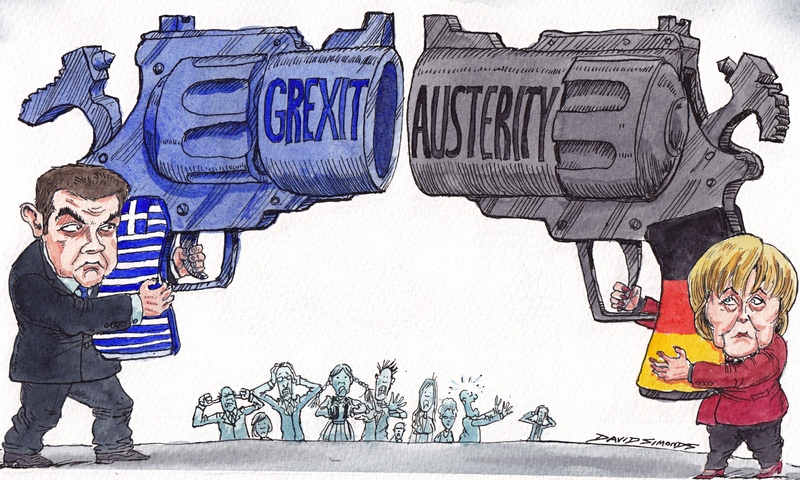 *A Grexit would be very similar to the Cypriot crisis. The EU/Cypriot Government was enforcing a loss on Cypriot deposit holders to pay for some of the bailout. In the same way, the EU/Greek Government would be enforcing a loss on Greek deposit holders through the depreciation of any new Greek currency (which is basically forcing them to pay for some of the bailout). It’s partly why the Cyprus saga was so concerning – it has laid the groundwork for all manner of economic shenanigan. The next obvious question is: will the sovereign debt (currently denominated in Euro) be converted into drachmas or remain denominated in Euro? If the bonds are re-denominated into drachmas, that would constitute a default. Staying euro-denominated would mean that the debt would have to be paid using Euros earned through trade flows – which are not going to be sufficient. I mean – they’re not sufficient now, and if you consider point 4 below, it makes it even less likely. Default on Euro-denominated debt is therefore virtually certain. But the costly part of secession would be corporate default. If the government changes back to the drachma, the private sector will no doubt be forced back as well – which means that they will default in the same way. Even if not forced, the private sector would still be earning in drachmas, trying to pay off euro-denominated debt. And given the monetary and fiscal stress that Greece is experiencing, the drachma would immediately, and drastically, devalue against the Euro. Ergo: corporate default. Corporate default = bankruptcy proceedings. Bankruptcy proceedings = many firings and domino effects (as one company goes, so this puts strain on its creditors, who may also go bankrupt, and so the cycle continues). In order for the drachma to function, domestic bank deposits would have to be re-denominated into drachmas. As the UBS analysts point out – there are a range of questions that arise here. Would the only accounts affected be euro-denominated? Would it only apply to bank accounts belonging to Greek residents? And what about the foreign branches of Greek banks? But in any case, long before the denomination takes places, there would be bank runs. Any account-holder would be foolish not to withdraw their full funds in Euro-cash immediately – and either place it into a foreign bank account, or hide it in a mattress. Could the bank runs be curbed? Possibly – by imposing withdrawal limits during the transition, or by making the re-denomination a shock event (ie. a re-denomination without warning – see reference to Cyprus above). But the former runs the risk of civil unrest, and the latter is…difficult. At the very least, bank officials in-the-know would seek to self-preserve – and in doing so, their actions would become a warning. Also at a regional level, given the ease with which the suspicion of secession can initiate bank runs, the collapse of the Greek banking system is quickest way for contagion to spread to its European neighbours. This almost goes without saying – to secede from the EMU is to secede from the EU. The UBS report does not attempt to quantify this cost – which makes me think that it is more qualitative. Obviously, there are trade repercussions, which I’ll get to shortly. But the biggest implication here, apart from trade, is that Greece would lose access to EU financial assistance. Given point 1, the secession would make Greece reliant on its trade flows for self-financing. But secession would also leave it without a trade agreement with Europe – which encompasses most of its trading partners. At the same time, the devaluation of the drachma may give a temporary competitive advantage – but the European Commission has specifically stated that it would “compensate” for any movement in the new currency (or it had stated that back in 2012 – I’m not sure if that still stands). This could be accomplished by a trade tariff being imposed on Greece equal to the advantage created by the devaluation. So trade would likely collapse. The risk of civil unrest would already be high during the transition with the panic and tension of a banking sector collapse. In fact, civil unrest seems to be a real risk at the moment. If the Greeks lose access to their bank accounts, that may well be the final straw. But also, immediately after the transition, I think that Greece would begin the process of monetizing its debts. The Government would still need to fund its current expenditure. And given the default, and the state of the taxation system, the easiest and most immediate source of financing would be money creation. It is highly unlikely that the Greek people would take this calmly. Then there is the political cost, which cannot be quantified. With secession and fragmentation, Europe would lose her voice on the international stage. Without considering the impact of civil unrest and the political cost, the UBS analysts conservatively estimated that Greece withdrawing from the Euro would cost her citizens between €9,500 and €11,500 per person in the first year, and between €3,000 and €4,000 per person in subsequent years. Whether or not they know about these numbers – it’s intuitive enough for 80% of the Greek people to be in favour of staying in the Euro. I could be safe and move my money. That’s why it’s called contagion. Because there is only downside to doing nothing.